DIE Martis, 23 die Septembris. Message from the H. C. with Committees Names for Lincoln. Letter from Guernsey, that the King is making great Preparations against them at Falmouth, and desiring Assistance. Order for Ships, &c. to be sent to their Assistance. Exchange of Lord Brahazon & al. for Lady Moore & al. Geldrop, a Merchant Stranger, not to be sent out of the Line of Communication for being a Papist. Company for planting The Summer Islands to export Goods Duty free. Message from the H. C. with an Order; and about their Accusation against L. Hunsdon. Message from the H. C. with a Commission for Sir R. King and Mr. Angloe to go to Ulster. Berkley Castle not to be demolished when taken. Message to the H. C. for Concurrence in the Votes formerly sent down, for clearing the E. of Denbigh, and to expedite his Accompts. L. Balmerino and Sir R. Heath. Guernsey to be supplied with Wool. Letter from L. Wharton, that they had not yet had a Meeting with the Scots Commissioners; and that the Cumberland Committee had dismissed their Regimental Forces. Letter from the Committee in Scotland, to the Scots Commissioners there, for a Meeting with them. Answer from the Scots Commissioners, that they have been retarded from the Meeting, by pursuing the Enemy. Letter from the Committee in Scotland, to the Cumberland Committee, about their having disbanded their Regimental Forces. Information concerning a Fleet fitting out at Falmouth, destined against Guernsey. 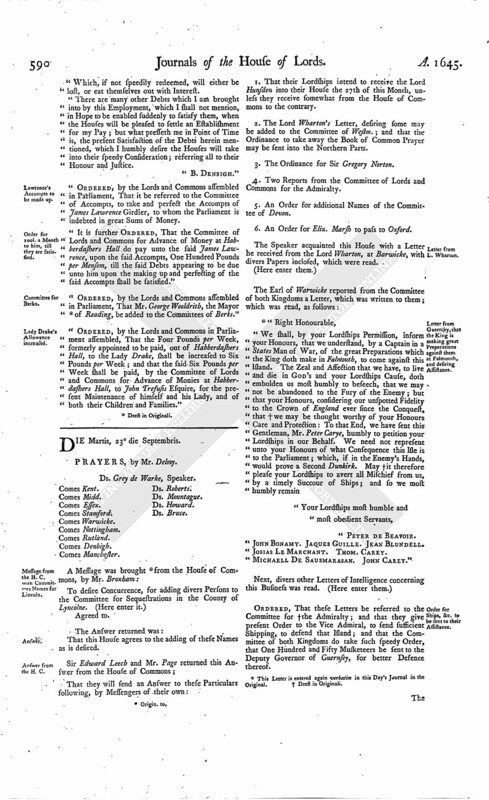 Ordinance for a Fleet for the Winter Guard. Ordinance to collect the Arrears due for the Earl of Manchester's Army in Essex. 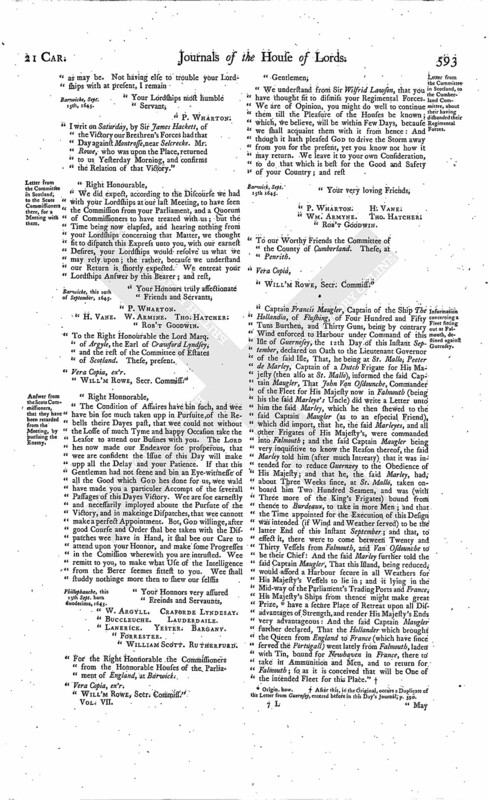 Ordinance concerning 800 Horse in Lincolnshire, raised by the Eastern Association. Order for 6184 l. for their Pay. Ordinance to continue the, One concerning Plymouth. Order for 300 l. to Sir Charles Egerton. Order for 500 l. for Gloucester Garrison. Ordinance to clear Edmonds of his Delinquency. Commission for Mr. Annestey, Sir R. King, and Colonel Beale, to be Chief Governors and Presidents of Ulster. Their Instructions for the Use of the Civil Power. Declaration against Carteret, Governor of Jersey, for his Severity to the Prisoners there. Letter from Guernsey, for, the free Exportation of Wool to them; and for the E. of Warwick to continue their Governor. That this House agrees to the adding of these Names as is desired. 1. That their Lordships intend to receive the Lord Hunsden into their House the 27th of this Month, unless they receive somewhat from the House of Commons to the contrary. 2. The Lord Wharton's Letter, desiring some may be added to the Committee of Westm. 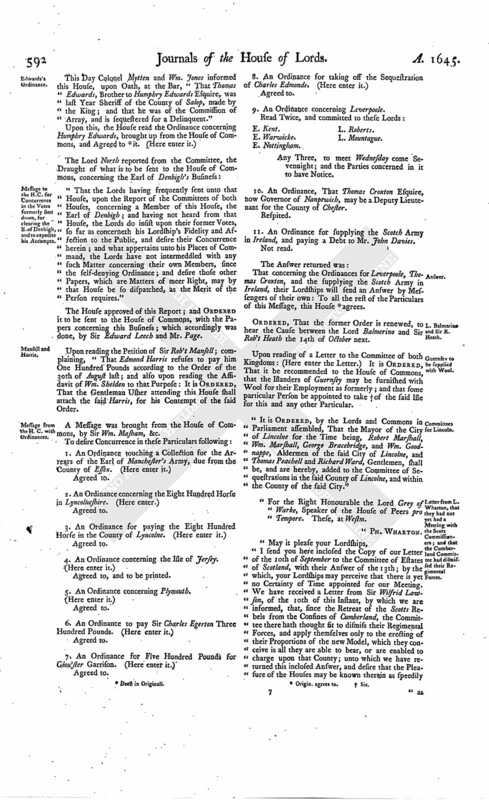 ; and that the Ordinance to take away the Book of Common Prayer may be sent into the Northern Parts. 3. 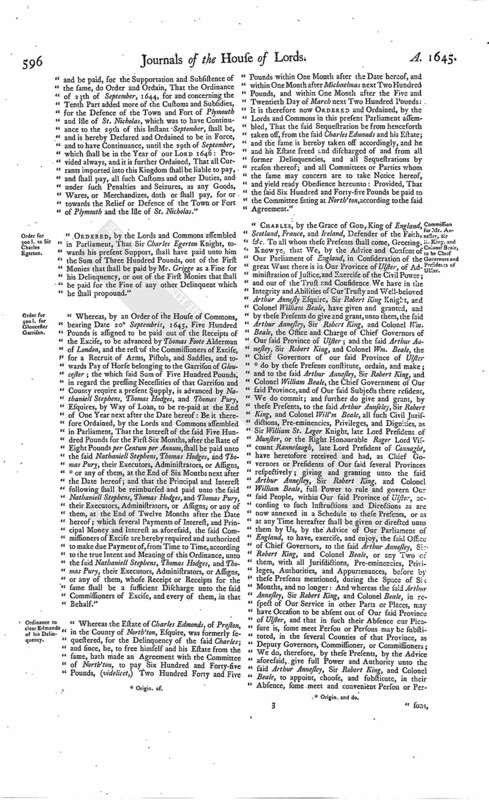 The Ordinance for Sir Gregory Norton. 4. 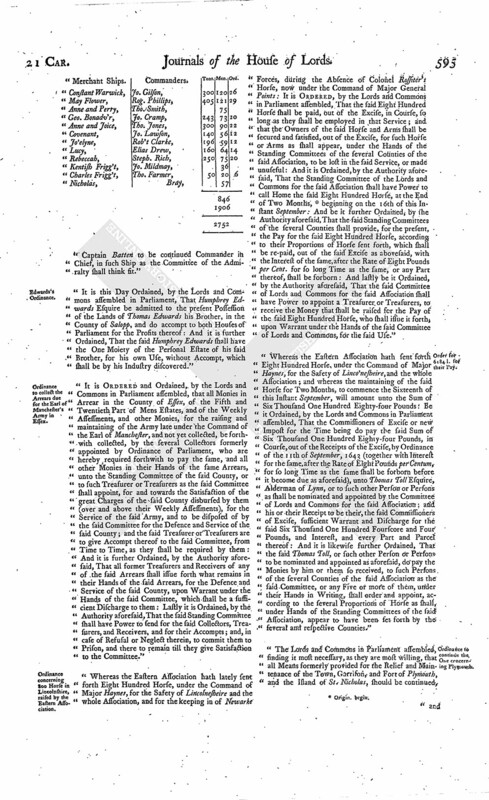 Two Reports from the Committee of Lords and Commons for the Admiralty. 5. An Order for additional Names of the Committee of Devon. 6. An Order for Eliz. Marsh to pass to Oxford. The Speaker acquainted this House with a Letter he received from the Lord Wharton, at Barwicke, with divers Papers inclosed, which were read. John Bonamy. Jaques Guille. Jean Blundell. Josias Le Marchant. Thom. Carey. Michaell De Sausmarasan. John Carey." Ordered, That these Letters be referred to the Committee for (fn. 3) the Admiralty; and that they give present Order to the Vice Admiral, to send sufficient Shipping, to defend that Island; and that the Committee of both Kingdoms do take such speedy Order, that One Hundred and Fifty Musketeers be sent to the Deputy Governor of Guernsey, for better Defence thereof. "Die Lunæ, 22 Septemb. 1645. "At the Committee of both Kingdoms, (fn. 4) at Derby House. "Ordered, That it be reported to both Houses, That this Committee doth agree with the Committee of Lords and Commons for Irish Affairs, concerning the Exchange of the Lord Brabazon, Sir Henry Tichborne, and Sir James Ware, now Prisoners in The Tower, for the Lady More, Sir Patricke Wennes, Sir Rob't Hannay, Captain Pensonby, Captain Wentworth, Lieutenant Draper, Mr. Butten, Mr. Townley, Lieutenant Townly, Quarter-master Hatch, and for Sir Wm. Parsons, Sir Adam Loftus, and Sir Rob't Meredith." Agreed to; and the Concurrence of the House of Commons desired herein. Upon reading the Petition of Sence Whately, the Widow of Tho. Whately, Apothecary, of London: It is Ordered, That it is referred to the Lord Mayor and Court of Aldermen of London, to call before them the Parties, and to examine the Truth of the Cause; and, if they find the Petitioner wronged, to procure her Satisfaction, or to certify the true State of the Cause to this House. Upon reading the Petition of George Geldrop, Merchant Stranger; shewing, "That, for the Space of Two and Twenty Years last past, he hath lived within the Cities of London and Westm. and hath been conformable and obedient to the Laws of this Kingdom, and behaved himself inoffensively all the said Time; yet, notwithstanding, he hath been of late convented before the Committee of Militia for and within the City and Liberty of Westm. sitting in The Savoy, and was ordered to depart out of the Lines of Communication; because he was a Roman Catholic, though he hath freely paid all Taxes and Assessments, and never was within the King's Quarters, or held any Correspondency with any of that Party; and for that he is a Merchant Stranger, and no Native, but born under the Dominion of the King of Spaine, he humbly desires he may enjoy the Privileges and Immunities due to Merchant Strangers, and agreed upon by the Articles between the Kingdoms of England and Spaine; and that he may be permitted to continue his Abode and Dwelling where he is now, without Interruption." It is Ordered, That the Committee for the Militia at The Savoy shall have Notice from this House, That it is not the Intention of this House, in the Ordinance for putting Papists out of the Line of Communication, to meddle with or remove Merchant Strangers. Upon reading this Petition of the Company of London, for Plantation of The Summer Islands; shewing, "That they intend to send to the said Islands divers Parcels of Goods, for the Relief of the Poor there; therefore desire that the said Goods may go Customfree, and the Commissioners of the Customs to have Directions accordingly." "Ordered, That this House grants this Petition; and that the Concurrence of the House of Commons be desired herein. 1000 Ells of Coarse Red Cotton. 50 Pounds-worth of Woollen Cloth. 12000 Ells of Lockram and Canvas. 150 Pounds-worth of Habberdashers Wares. 50 Pounds-worth of Grocery Ware. 20 Pounds-worth of Iron Wares. 2 Tuns of Strong Waters. 20 Dozen of Wool Cards. 150 Pounds-worth of Shoemakers Thread. 1000 Gross of Tobacco Pipes. 10 Dozen of Canvas Suits. 5 Dozen of Monmouth Caps. 2 Tuns of Rozin and Pitch. 100 Pounds-worth of old Houshold-stuff. 50 Pounds-worth of Fishing-lines and Hooks. To desire Concurrence in an Order concerning appointing of the Winter Guard at Sea. 2. That the House of Commons having received a Message from this House, concerning the Lord Hunsden's Business; in regard a Member of their House, who hath all the Papers concerning that Business, is out of Town, they desire a Fortnight's Time longer than their Lordships have appointed. That this House agrees to the Order concerning the Winter Guard at Sea; and touching their Desire concerning the enlarging the Time for the Lord Hunsden's Business, this House is contented to put it off till Saturday come (fn. 5) Sevennight. Ordered, That the Commissioners of the Great Seal (fn. 6) do pass this Commission under the Great Seal of England. That this House agrees to the said Commission. Upon reading the Petition of George Lord Barckly; desiring, "That when his Castle of Barckly be taken, it may not be demolished, but a Garrison put in for the Service of the Parliament." It is Ordered, That it be referred to the Committee of both Kingdoms, to take Care herein; but as touching a Governor, the House thought it not fit to resolve any Thing therein until the Castle be taken. This Day Colonel Mytten and Wm. Jones informed this House, upon Oath, at the Bar, "That Thomas Edwards, Brother to Humphry Edwards Esquire, was last Year Sheriff of the County of Salop, made by the King; and that he was of the Commission of Array, and is sequestered for a Delinquent." "That the Lords having frequently sent unto that House, upon the Report of the Committees of both Houses, concerning a Member of this House, the Earl of Denbigh; and having not heard from that House, the Lords do insist upon their former Votes, so far as concerneth his Lordship's Fidelity and Affection to the Public, and desire their Concurrence herein; and what appertains unto his Places of Command, the Lords have not intermeddled with any such Matter concerning their own Members, since the self-denying Ordinance; and desire those other Papers, which are Matters of meer Right, may by that House be so dispatched, as the Merit of the Person requires." The House approved of this Report; and Ordered it to be sent to the House of Commons, with the Papers concerning this Business; which accordingly was done, by Sir Edward Leech and Mr. Page. Upon reading the Petition of Sir Rob't Mansell; complaining, "That Edmond Harris refuses to pay him One Hundred Pounds according to the Order of the 30th of August last; and also upon reading the Affidavit of Wm. Shelden to that Purpose: It is Ordered, That the Gentleman Usher attending this House shall attach the said Harris, for his Contempt of the said Order. A Message was brought from the House of Commons, by Sir Wm. Masham, &c.
4. 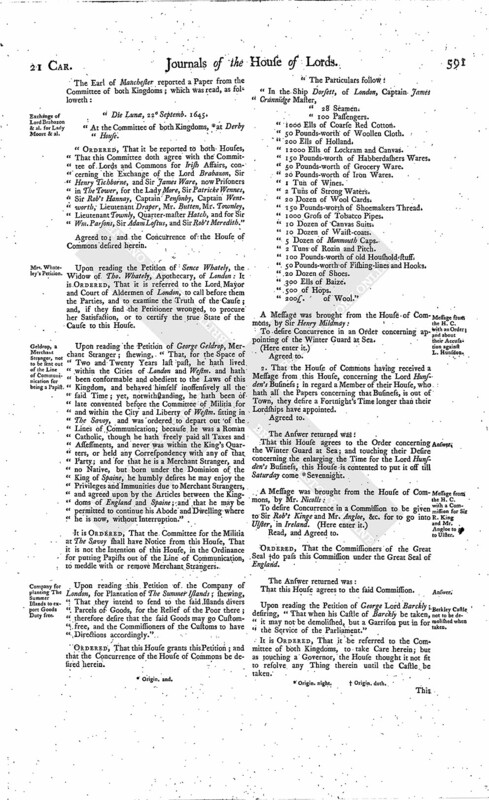 An Ordinance concerning the Isle of Jersey. 5. An Ordinance concerning Plymouth. 9. An Ordinance concerning Leverpoole. Any Three, to meet Wednesday come Sevennight; and the Parties concerned in it to have Notice. 10. An Ordinance, That Thomas Croxton Esquire, now Governor of Nanptwich, may be a Deputy Lieutenant for the County of Chester. 11. An Ordinance for supplying the Scotch Army in Ireland, and paying a Debt to Mr. John Davies. That concerning the Ordinances for Leverpoole, Thomas Croxton, and the supplying the Scotch Army in Ireland, their Lordships will send an Answer by Messengers of their own: To all the rest of the Particulars of this Message, this House (fn. 8) agrees. Ordered, That the former Order is renewed, to hear the Cause between the Lord Balmerino and Sir Rob't Heath the 14th of October next. Upon reading of a Letter to the Committee of both Kingdoms: (Here enter the Letter.) It is Ordered, That it be recommended to the House of Commons, that the Islanders of Guernsey may be furnished with Wool for their Employment as formerly; and that some particular Person be appointed to take (fn. 9) of the said Isle for this and any other Particular. "It is Ordered, by the Lords and Commons in Parliament assembled, That the Mayor of the City of Lincolne for the Time being, Robert Marshall, Wm. Marshall, George Bracebridge, and Wm. Goodnappe, Aldermen of the said City of Lincolne, and Thomas Peachell and Richard Ward, Gentlemen, shall be, and are hereby, added to the Committee of Sequestrations in the said County of Lincolne, and within the County of the said City." "For the Right Honourable the Lord Grey of Warke, Speaker of the House of Peers pro Tempore. These, at Westm. "I writ on Saturday, by Sir James Hackett, of the Victory our Brethren's Forces had that Day against Montrosse, near Selcrecke. Mr. Rowe, who was upon the Place, returned to us Yesterday Morning, and confirms the Relation of that Victory." Barwicke, this 10th of September, 1645. To the Right Honourable the Lord Marq. of Argyle, the Earl of Crawford Lyndsey, and the rest of the Committee of Estates of Scotland. These, present. Phillophauche, this 13th Sept. hora duodecima, 1645. "For the Right Honnorable the Commissioners from the Honnorable Houses of the Parliament of England, at Barwick. "To our Worthy Friends the Committee of the County of Cumberland. These, at Penrith. "The chiefest of my Unhappiness I may esteem to be, the long Intermission of Time since your Lordship pleased to honour me with your last Letter; but that is in Part dispelled, by the happy Information I received by Lieutenant Temple (who is lately here arrived), that your Lordship intends by the next to give Answer to all my Letters not before answered. I beseech your Lordship to pardon this my Presumption, and to esteem no otherwise thereof than as a Proceed of my faithful Duty; as also that your Lordship would please to give me Leave still to present your Lordship with the present Posture of Affairs here. "Your Lordship first may please to be informed, that (in my former Letters having omitted it) I think it my Duty to let your Lordship know, that, on the Fifth of July last, Captain Hodges arriving here, with a Prize, wherein were many Gentlemen of the King's Party Prisoners, the Seamen having requested that some Means might be used for Joseph Bransby's Enlargement out of the Castle, I did (to encourage Seamen) permit Captain Hodges to send his Boat to the Castle, with a Letter to Sir Peter Osborne, offering a Gentleman Prisoner as an Exchange for the said Joseph, and by it sent unto Sir Peter the Books of News of the great Victories obtained by Sir Thomas Fairefax. To the Exchange Sir Peter Osborne answered, by Letter to Captain Hodges, "That he would not admit it as yet upon any Terms:" For the News, it wrought so much on him, that, as I am informed, he would have surrendered the Castle; but was therein opposed by Seigneur Sausmarez and the Porter, and, as I hear since, questioned for the same. "I shall with extreme Joy kiss your Lordship's Letter; and beg that I may be thereby instructed to whom to address my Dispatches of the State of Affairs here; as also (fn. 12) that it may instruct me more fully concerning your Lordship's Apprehension of my Letters as too short in Expression, it being my Desire to know my Errors, and in all Things to submit myself and Affairs to your Lordship's Pleasure; it being my daily Study, and greatest Ambition, to gain your Lordship's good Understanding of me and all my Actions. "I beseech your Lordship's Endeavours, for the allotting of The Welcome and Dove Pinks, for our Winter Guard; and that the Service may not be neglected, I request your Lordship to endeavour that there may be an Order issued, for the paying their Company, and their re-victualling at Portsmo. when they shall have spent their present Victual, wherein your Lordship will much advance this Service. "To the Right Honourable and my singular good Lord Robert Earl of Warwick. These, present." "It is this Day Ordered, by the Lords and Commons assembled in Parliament, That the Sea Guard, for the Defence of this Kingdom, upon the English, Scottish, and Irish Coast, for this Winter, shall consist only of Twenty-two of His Majesty's Ships and Pinnaces, and Twelve Merchants Ships and Pinnaces, according to a List hereunto annexed: And it is further Ordered, That the Committee of the Navy, with the Approbation of the Committee of the Admiralty, shall hereby have Power, as they see Cause, to lessen the said Number of Ships, or to discharge any of the said Ships, and put others in their Rooms: And it is lastly Ordered, That the said Committee do likewise take present Course, and give Order, that Victual and other Necessaries be provided, for those Ships of His Majesty's, for the said Winter Service; and that they give Notice to the Owners of the Merchants Ships, that they make Provisions of Victuals for their several Ships for the like Time." "A List of such of His Majesty's Ships and Vessels, as also of the Merchant-men, as are to be continued forth at Sea, for this Winter Guard, 1645, in the Service of the Parliament. King's Ships. Commanders. Tons. Men. Ord. Merchant Ships. Commanders. Tons. Men. Ord. "Captain Batten to be continued Commander in Chief, in such Ship as the Committee of the Admiralty shall think fit." "It is this Day Ordained, by the Lords and Commons assembled in Parliament, That Humphrey Edwards Esquire be admitted to the present Possession of the Lands of Thomas Edwards his Brother, in the County of Salopp, and do accompt to both Houses of Parliament for the Profits thereof: And it is further Ordained, That the said Humphrey Edwards shall have the One Moiety of the Personal Estate of his said Brother, for his own Use, without Accompt, which shall be by his Industry discovered." "It is Ordered and Ordained, by the Lords and Commons in Parliament assembled, that all Monies in Arrear in the County of Essex, of the Fifth and Twentieth Part of Mens Estates, and of the Weekly Assessments, and other Monies, for the raising and maintaining of the Army late under the Command of the Earl of Manchester, and not yet collected, be forthwith collected, by the several Collectors formerly appointed by Ordinance of Parliament, who are hereby required forthwith to pay the same, and all other Monies in their Hands of the same Arrears, unto the Standing Committee of the said County, or to such Treasurer or Treasurers as the said Committee shall appoint, for and towards the Satisfaction of the great Charges of the said County disbursed by them (over and above their Weekly Assessments), for the Service of the said Army, and to be disposed of by the said Committee for the Defence and Service of the said County; and the said Treasurer or Treasurers are to give Accompt thereof to the said Committee, from Time to Time, as they shall be required by them: And it is further Ordained, by the Authority aforesaid, That all former Treasurers and Receivers of any of the said Arrears shall issue forth what remains in their Hands of the said Arrears, for the Defence and Service of the said County, upon Warrant under the Hands of the said Committee, which shall be a sufficient Discharge to them: Lastly it is Ordained, by the Authority aforesaid, That the said Standing Committee shall have Power to send for the said Collectors, Treasurers, and Receivers, and for their Accompts; and, in case of Refusal or Neglect therein, to commit them to Prison, and there to remain till they give Satisfaction to the Committee." "Whereas the Eastern Association hath lately sent forth Eight Hundred Horse, under the Command of Major Haynes, for the Safety of Lincolnesheire and the whole Association, and for the keeping in of Newarke Forces, during the Absence of Colonel Rossiter's Horse, now under the Command of Major General Points: It is Ordered, by the Lords and Commons in Parliament assembled, That the said Eight Hundred Horse shall be paid, out of the Excise, in Course, so long as they shall be employed in that Service; and that the Owners of the said Horse and Arms shall be secured and satisfied, out of the Excise, for such Horse or Arms as shall appear, under the Hands of the Standing Committees of the several Counties of the said Association, to be lost in the said Service, or made unuseful: And it is Ordained, by the Authority aforesaid, That the Standing Committee of the Lords and Commons for the said Association shall have Power to call Home the said Eight Hundred Horse, at the End of Two Months, (fn. 14) beginning on the 16th of this Instant September: And be it further Ordained, by the Authority aforesaid, That the said Standing Committees of the several Counties shall provide, for the present, the Pay for the said Eight Hundred Horse, according to their Proportions of Horse sent forth, which shall be re-paid, out of the said Excise as abovesaid, with the Interest of the same, after the Rate of Eight Pounds per Cent. for so long Time as the same, or any Part thereof, shall be forborn: And lastly be it Ordained, by the Authority aforesaid, That the said Committee of Lords and Commons for the said Association shall have Power to appoint a Treasurer or Treasurers, to receive the Money that shall be raised for the Pay of the said Eight Hundred Horse, who shall issue it forth; upon Warrant under the Hands of the said Committee of Lords and Commons, for the said Use." "Whereas the Eastern Association hath sent forth Eight Hundred Horse, under the Command of Major Haynes, for the Safety of Linco'nesheire, and the whole Association; and whereas the maintaining of the said Horse for Two Months, to commence the Sixteenth of this Instant September, will amount unto the Sum of Six Thousand One Hundred Eighty-four Pounds: Be it Ordained, by the Lords and Commons in Parliament assembled, That the Commissioners of Excise or new Impost for the Time being do pay the said Sum of Six Thousand One Hundred Eighty-four Pounds, in Course, out of the Receipts of the Excise, by Ordinance of the 11th of September, 1643 (together with Interest for the same, after the Rate of Eight Pounds per Centum, for so long Time as the same shall be forborn before it become due as aforesaid), unto Thomas Toll Esquire, Alderman of Lynn, or to such other Person or Persons as shall be nominated and appointed by the Committee of Lords and Commons for the said Association: and his or their Receipt to be their, the said Commissioners of Excise, sufficient Warrant and Discharge for the said Six Thousand One Hundred Fourscore and Four Pounds, and Interest, and every Part and Parcel thereof: And it is likewise further Ordained, That the said Thomas Toll, or such other Person or Persons to be nominated and appointed as aforesaid, do pay the Monies by him or them so received, to such Persons of the several Counties of the said Association as the said Committee, or any Five or more of them, under their Hands in Writing, shall order and appoint, according to the several Proportions of Horse as shall, under Hands of the Standing Committees of the said Association, appear to have been set forth by the several and respective Counties." 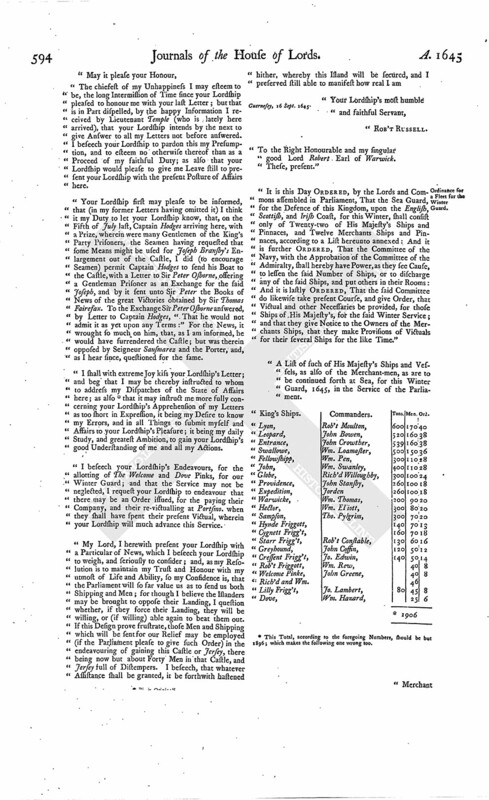 "The Lords and Commons in Parliament assembled, finding it most necessary, as they are most willing, that all Means formerly provided for the Relief and Maintenance of the Town, Garrison, and Fort of Plymouth, and the Island of St. Nicholas, should be continued, and be paid, for the Supportation and Subsistence of the same, do Order and Ordain, That the Ordinance of 23th of September, 1644, for and concerning the Tenth Part added more of the Customs and Subsidies, for the Defence of the Town and Fort of Plymouth and Isle of St. Nicholas, which was to have Continuance to the 29th of this Instant September, shall be, and is hereby Declared and Ordained to be in Force, and to have Continuance, until the 29th of September, which shall be in the Year of our Lord 1646: Provided always, and it is further Ordained, That all Currants imported into this Kingdom shall be liable to pay, and shall pay, all such Customs and other Duties, and under such Penalties and Seizures, as any Goods, Wares, or Merchandizes, doth or shall pay, for or towards the Relief or Defence of the Town or Fort of Plymouth and the Isle of St. Nicholas." "Ordered, by the Lords and Commons assembled in Parliament, That Sir Charles Egerton Knight, towards his present Support, shall have paid unto him the Sum of Three Hundred Pounds, out of the First Monies that shall be paid by Mr. Grigge as a Fine for his Delinquency, or out of the First Monies that shall be paid for the Fine of any other Delinquent which he shall propound." "Whereas, by an Order of the House of Commons, bearing Date 20 Septembris, 1645, Five Hundred Pounds is assigned to be paid out of the Receipts of the Excise, to be advanced by Thomas Foote Alderman of London, and the rest of the Commissioners of Excise, for a Recruit of Arms, Pistols, and Saddles, and towards Pay of Horse belonging to the Garrison of Gloucester; the which said Sum of Five Hundred Pounds, in regard the pressing Necessities of that Garrison and County require a present Supply, is advanced by Nathaniell Stephens, Thomas Hodges, and Thomas Pury, Esquires, by Way of Loan, to be re-paid at the End of One Year next after the Date hereof: Be it therefore Ordained, by the Lords and Commons assembled in Parliament, That the Interest of the said Five Hundred Pounds for the First Six Months, after the Rate of Eight Pounds per Centum per Annum, shall be paid unto the said Nathaniell Stephens, Thomas Hodges, and Thomas Pury, their Executors, Administrators, or Assigns, (fn. 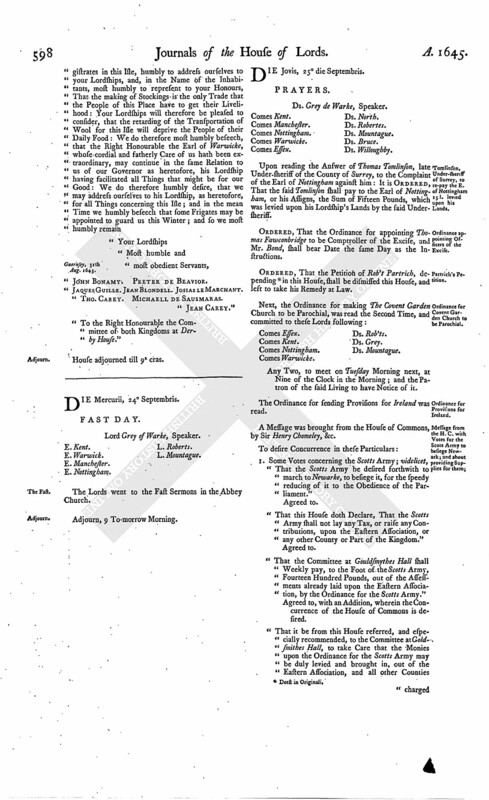 15) or any of them, at the End of Six Months next after the Date hereof; and that the Principal and Interest following shall be reimbursed and paid unto the said Nathaniell Stephens, Thomas Hodges, and Thomas Pury, their Executors, Administrators, or Assigns; or any of them, at the End of Twelve Months after the Date hereof; which several Payments of Interest, and Principal Money and Interest as aforesaid, the said Commissioners of Excise are hereby required and authorized to make due Payment of, from Time to Time, according to the true Intent and Meaning of this Ordinance, unto the said Nathaniell Stephens, Thomas Hodges, and Thomas Pury, their Executors, Administrators, or Assigns, or any of them, whose Receipt or Receipts for the same shall be a sufficient Discharge unto the said Commissioners of Excise, and every of them, in that Behalf." "Whereas the Estate of Charles Edmonds, of Preston, in the County of North'ton, Esquire, was formerly sequestered, for the Delinquency of the said Charles; and since, he, to free himself and his Estate from the same, hath made an Agreement with the Committee of North'ton, to pay Six Hundred and Forty-five Pounds, (videlicet,) Two Hundred Forty and Five Pounds within One Month after the Date hereof, and within One Month after Michaelmas next Two Hundred Pounds, and within One Month after the Five and Twentieth Day of March next Two Hundred Pounds: It is therefore now Ordered and Ordained, by the Lords and Commons in this present Parliament assembled, That the said Sequestration be from henceforth taken off, from the said Charles Edmonds and his Estate; and the same is hereby taken off accordingly, and he and his Estate freed and discharged of and from all former Delinquencies, and all Sequestrations by reason thereof; and all Committees or Parties whom the same may concern are to take Notice hereof, and yield ready Obedience hereunto: Provided, That the said Six Hundred and Forty-five Pounds be paid to the Committee sitting at North'ton, according to the said Agreement." "Charles, by the Grace of God, King of England, Scotland, France, and Ireland, Defender of the Faith, &c. To all whom these Presents shall come, Greeting. Know ye, that We, by the Advice and Consent of Our Parliament of England, in Consideration of the great Want there is in Our Province of Ulster, of Administration of Justice, and Exercise of the Civil Power; and out of the Trust and Confidence We have in the Integrity and Abilities of Cur Trusty and Well-beloved Arthur Annesley Esquire, Sir Robert King Knight, and Colonel William Beale, have given and granted, and by these Presents do give and grant, unto them, the said Arthur Annesley, Sir Robert King, and Colonel Wm. Beale, the Office and Charge of Chief Governors of Our said Province of Ulster; and the said Arthur Annesley, Sir Robert King, and Colonel Wm. Beale, the Chief Governors of our said Province of Ulster (fn. 16) do by these Presents constitute, ordain, and make; and to the said Arthur Annesley, Sir Robert King, and Colonel William Beale, the Chief Government of Our said Province, and of Our said Subjects there resident, We do commit; and further do give and grant, by these Presents, to the said Arthur Annseley, Sir Robert King, and Colonel Will'm Beale, all such Civil Jurisdictions, Pre-eminencies, Privileges, and Dignities, as Sir William St. Leger Knight, late Lord President of Munster, or the Right Honourable Roger Lord Viscount Rannelaugh, late Lord President of Connaght, have heretofore received and had, as Chief Governors or Presidents of Our said several Provinces respectively; giving and granting unto the said Arthur Annesley, Sir Robert King, and Colonel William Beale, full Power to rule and govern Our said People, within Our said Province of Ulster, according to such Instructions and Directions as are now annexed in a Schedule to these Presents, or as at any Time hereafter shall be given or directed unto them by Us, by the Advice of Our Parliament of England, to have, exercise, and enjoy, the said Office of Chief Governors, to the said Arthur Annesley, Sir Robert King, and Colonel Beale, or any Two of them, with all Jurisdictions, Pre-eminencies, Privileges, Authorities, and Appurtenances, before by these Presents mentioned, during the Space of Six Months, and no longer: And whereas the said Arthur Annesley, Sir Robert King, and Colonel Beale, in respect of Our Service in other Parts or Places, may have Occasion to be absent out of Our said Province of Ulster, and that in such their Absence our Pleasure is, some meet Person or Persons may be substituted, in the several Counties of that Province, as Deputy Governors, Commissioner, or Commissioners; We do, therefore, by these Presents, by the Advice aforesaid, give full Power and Authority unto the said Arthur Annesley, Sir Robert King, and Colonel Beale, to appoint, choose, and substitute, in their Absence, some meet and convenient Person or Per sons, to be their Deputy Governors, Commissioner, or Commissioners, in each County of the said Province of Ulster respectively; and the said Person or Persons, so appointed, chosen, and substituted, We do by these Presents authorize to govern and rule the several Counties of Our said Province of Ulster, in the Absence of the said Arthur Annesley, Sir Robert King, and Colonel Beale, to all Respects and Purposes, as if the said Arthur Annesley, Sir Robert King, and Colonel Beale, were personally present, and did and might, rule by Authority aforesaid; willing, and hereby strictly charging and commanding, all Our Officers, as well Civil as Martial; and all Manner of Our loving Subjects, to be respectively aiding, and assistant, and obedient, in and to the said Arthur Annesley, Sir Robert King, and Colonel Beale, or any other or others authorized by or under them, or any Two of them, as aforesaid, in the Execution of the said Office and Charge of Chief Governors of Our said Province of Ulster, as they will answer the contrary at their Perils." "Instructions for Exercise of the Civil Power, by Arthur Annesley Esquire, Sir Robert King Knight, and Colonel Beale, in the Province of Ulster, in Ireland. "You shall determine (by the Advice, and with the Assistance, of such of the Chief Persons of Quality as you shall call to sit with you) all Civil Actions, as well Real as Personal, and all Suits and Controversies whatsoever shall happen betwixt Party and Party; and shall punish all such Offences and Misdemeanors, in such Manner and Form, and according to such Process and Proceedings, by Fines, Imprisonments, and Corporal Punishments, as have been formerly used in the Presidents of Munster or Connaght, in the Time, and during the Government, of the late Lord Presidents. "You shall carefully dispose and improve all such Lands, Tenements, Rents, Goods, Chattels, Hereditaments, either by Lease or Gustodium, during the Wars, as have or shall belong to any of the Rebels or their Abettors, towards the Maintenance of that War, or of such Persons as have merited in that Service, so that there may be an Accompt had and taken thereof whensoever it shall be required. "You shall settle Customers and other Officers, to collect the Profits coming by Fishings, Customs, Prize Wines, Bishops Lands, the Lands of Deans and Chapters, and other lawful Ways, which have hitherto gone to private Purses, and shall issue the same with Equality, to ease the Public Charge; and shall call to Accompt all Persons whatsoever, that have made private Advantage thereof since the Rebellion; and because of the extreme Scarcity of Provision, Cattle, and Carriage Horses, they shall settle some Course for to hinder the transporting of Horses and Cattle of all Sorts, and shall punish the Offenders in that Kind, according to their Offence; and shall appoint Officers, to seize the Ships, Barks, and Boats, with the Goods in them, of any Owner that shall, after Notice given of this Restraint, make any such Transportation; and of the Forfeiture in this Kind, the One Moiety shall be converted to the Use of the Party informing and seizing, and the other Part to the Use of the Army. "You shall settle the Inhabitants of the Country in a Certainty what Contribution they are to pay, and not leave them to the Will of the Officer and Soldier. "You shall call to Accompt all those that have had the Receipt of any Provision, of what Sort soever, either from hence or any other Part, to have been distributed to the Regiments and Troops in Ireland, and examine how they have disposed thereof. "You shall restrain the promiscuous Cutting of Timber, and other Woods there, for private Profit, by those that have no Right or Interest therein. "You shall; by yourselves or Deputies, tender to the People the National League and Covenant. "You shall conform yourselves, and all others there under your Command, to such Form of Church Government and Discipline as shall be set forth by Authority of Parliament; and you shall sufficiently provide for such godly Ministers as shall submit to that Government and Discipline, and remove the scandalous. 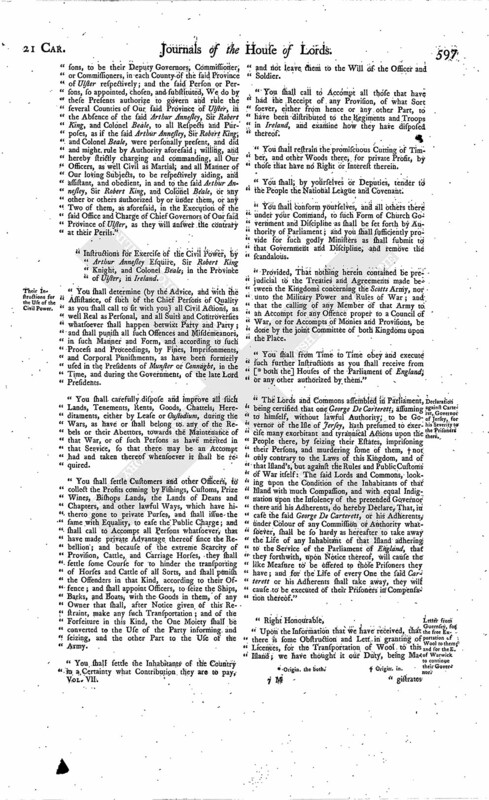 "Provided, That nothing herein contained be prejudicial to the Treaties and Agreements made between the Kingdoms concerning the Scotts Army, nor unto the Military Power and Rules of War; and that the calling of any Member of that Army to an Accompt for any Offence proper to a Council of War, or for Accompts of Monies and Provisions, be done by the joint Committee of both Kingdoms upon the Place. "You shall from Time to Time obey and execute such further Instructions as you shall receive from [ (fn. 17) both the] Houses of the Parliament of England, or any other authorized by them." "The Lords and Commons assembled in Parliament, being certified that one George De Carterett, assuming to himself, without lawful Authority, to be Governor of the Isle of Jersey, hath presumed to exercise many exorbitant and tyrannical Actions upon the People there, by seizing their Estates, imprisoning their Persons, and murdering some of them, (fn. 18) not only contrary to the Laws of this Kingdom, and of that Island's, but against the Rules and Public Customs of War itself: The said Lords and Commons, looking upon the Condition of the Inhabitants of that Island with much Compassion, and with equal Indignation upon the Insolency of the pretended Governor there and his Adherents, do hereby Declare, That, in case the said George De Carterett, or his Adherents, under Colour of any Commission or Authority whatsoever, shall be so hardy as hereafter to take away the Life of any Inhabitant of that Island adhering to the Service of the Parliament of England, that they forthwith, upon Notice thereof, will cause the like Measure to be offered to those Prisoners they have; and for the Life of every One the said Carterett or his Adherents shall take away, they will cause to be executed of their Prisoners in Compensation thereof." "John Bonamy. Peeter de Beavior. "Jaques Guille. Jean Blondell. Josiasle Marchant. Tho. Carey. Michaell de Sausmaras. "To the Right Honourable the Committee of both Kingdoms at Derby House." 2. This Letter is entered again verbatim in this Day's Journal in the Original. 11. After this, in the Original, occurs a Duplicate of the Letter from Guernsey, entered before in this Day's Journal; p. 590. 13. This Total, according to the foregoing Numbers, should be but 1896; which makes the following one wrong too.